We were in need of a beach. Fleeing the impending northern cold and heading to the southeast U.S. coast, we sought warmth and water. Scot visited Hilton Head Island over twenty years ago and was so impressed by the beach that it was added to our list of destinations. A long, wide swath of hard-packed sand lends to bike riding on top of and along it. New shells, many sand dollars, starfish and horseshoe crabs abound. And, of course, it is beautiful — a must-see. 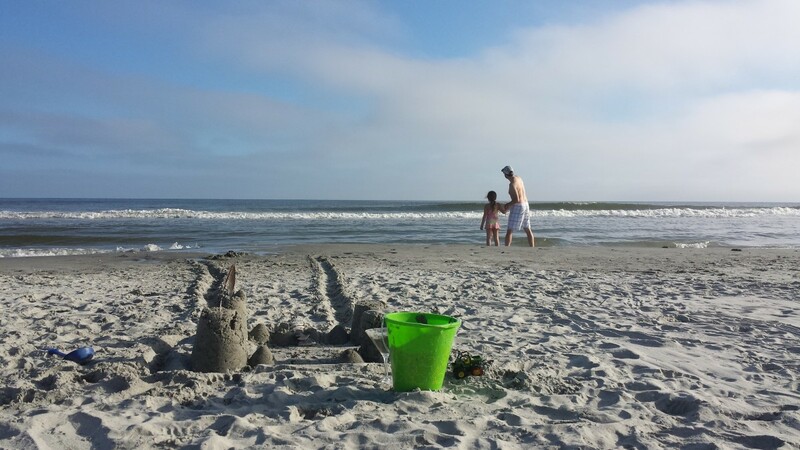 However, the beach may have been calling, but Hilton Head is expensive and very touristy, two aspects of our slow and low travel that fail to fit the budget or itinerary. It will have to wait for another time. So what does one do when one needs a beach along the southeast coast of the United States? Put a call out to the Universe. 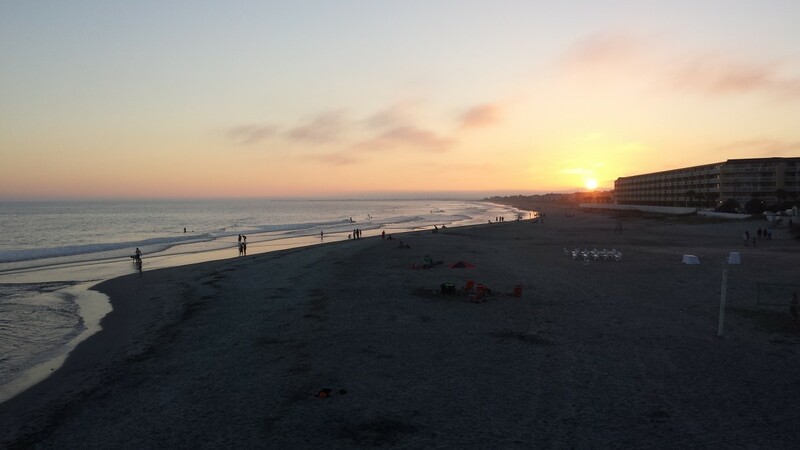 We had never heard of Folly Beach, South Carolina, until a friend suggested that we go there instead of Hilton Head, knowing we were averse to uber-tourism, preferring a slower pace. She loves it there and thought that we might, too. She was right on time, because there may have been nothing else to lure us to Charleston. Folly Beach led us to James Island County Park Campground and to many more lovely things in Charleston, which made for a tapestry of experiences there. No matter what, in the end and in our future, It is all about the beach. 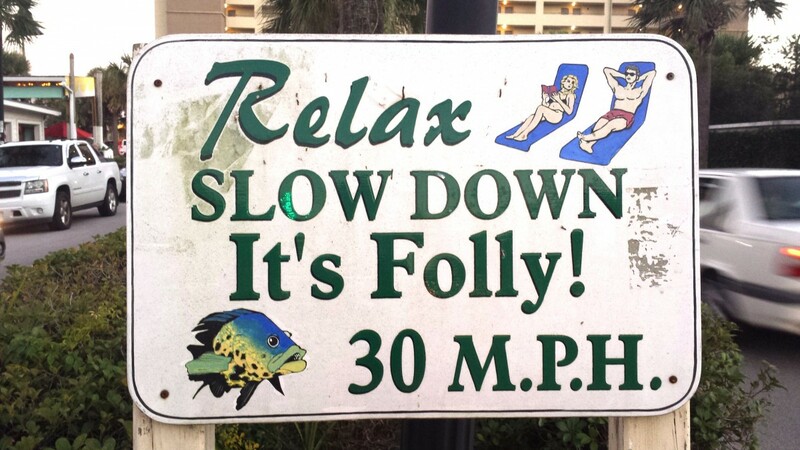 If ever you wish to gain an intense relaxation contact buzz from a beach, it could happen at Folly Beach. Set at “The Edge of America” on the coast of Folly Island in Charleston, Folly Beach it is one of our favorite beaches and boasts a charming town of the same name. It is unlikely that you will find much slower paces elsewhere: Folly Beach ranks high on the chill factor. Reminiscent of a mix between the mellow beaches in Maui and Oval Beach in Michigan, Folly Beach is everything tranquila. Grab your hammock, pack the picnic basket, bring some beach toys and plan to spend the day in suspended Om. Folly Beach is Charleston’s Beach city. A small town of just over two thousand, Folly Beach is known for its surfing, restaurants, small shops, businesses and bars. The island itself has seen its share of high-impact people and events — pirates, soldiers, composers and hurricanes — but positive vibes are all that remain in this laid back and very tangible island town. Folly Beach County Park is operated by the Charleston County Park and Recreation Commission, the same organization that oversees so many other wonderful sites and events around Charleston, such as McLeod Plantation, James Island County Park and more. It is a beautiful, clean beach with lots of space for everyone, as well as bathrooms and changing stations. When we visited, there was no charge to park. The views were stunning — Atlantic to the east and marshland to the west. It is an amazing place to go and relax. After a visit to the pier, we were on the lookout for some local seafood and open-air dining at Folly Beach Crab Shack, where Luna learned to shuck peanuts (and made them her entire meal) and we adults indulged in some local small plates. Then we headed to Loggerhead’s Beach Grill for some live music on the patio and to just continue chillin’ out with the ocean breeze. Then we turned back toward the sunset for our campground home. What a delight. What a day. While relaxing on the beach that day, Scot said with a smile, “Folly Beach has everything from Hilton Head that I wanted to show you.” We found what we were looking for and Folly Beach confirmed our desire to be beach bums for as often as possible: Stay warm and by the water, as we like to say. The smell of the ocean air is intoxicating and we’re addicted to Folly Beach. Folly Beach has had possibilities for me. Now it’s a definite must see for me.